Microsoft and Sony are lined up head-to-head at E3 working to win over gamers to side with their respective next-gen consoles. After sitting through both the Xbox One and the PlayStation 4 press conferences and getting some hands-on time with the two systems, here’s our breakdown of what we think of the two. Sony learned its lesson from the previous generation of consoles and managed to come in below Microsoft’s price point. A $100 difference is a serious advantage for the PS4, and Microsoft’s going to have to work overtime to convince gamers that its system is worth the extra cash. However, it’s worth noting that Microsoft is billing its next-gen console as an “all-in-one entertainment system”. When paired with SmartGlass, the Xbox One is meant to be a fully-featured media device for the living room. I know it’s a bit like comparing different kinds of fruit, but you could think of the Microsoft’s media add-ons as roughly equivalent to an Apple TV. Seen in that light, I’m sure some consumers would still opt for the PS4, but I can see how mainstream users could get enough value out of the Xbox One’s extra entertainment features. Sony says it has 100 PS4 games coming in the first year, 40 of which will have experiences unique to the platform. Microsoft showed off 13 exclusive titles at its press conference, and Microsoft Studios plans to publish 15 exclusive titles during the console’s first year. Corporate marketing spin is in full force, though, and the impact of the word “exclusive” is becoming diluted. Lots of Sony’s “unique” experiences sound like minor in-game content like an extra mission or oufit. Meanwhile, Microsoft has negotiated some timed exclusive deals with titles like Battlefield 4 to get downloadable content for the Xbox One first. While Final Fantasy XV was originally supposed to be a PS3 exclusive (back when it was called Final Fantasy Versus XIII), Square Enix revealed at E3 that the game will arrive on the Xbox One. That’s a pretty big feather to fall out of Sony’s cap. Personally, I’m more excited for the games coming to Xbox One. Dead Rising 3 looks really fun and Ryse is suitably epic. On the Sony side, inFamous Second Son has potential, but the hands-off demo was all superpower without any balance. It’s hard to overstate the hole that Microsoft is currently digging with its digital licensing policy for Xbox One games. Sony really laid into Microsoft at its press conference on Monday, and the zingers that it managed to get in were the talk of the E3 show floor yesterday. 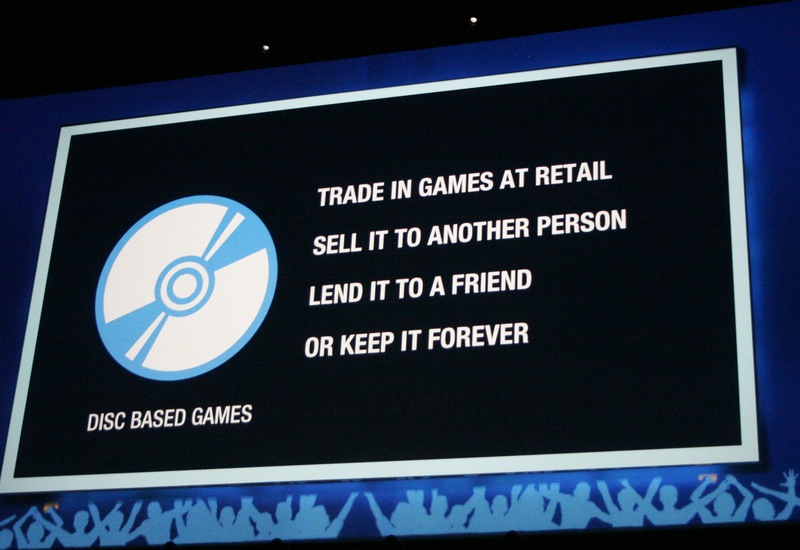 When Sony announced that it would support used games and offline play, the crowd gave it a standing ovation. That’s a victory that Microsoft practically handed to them. Sony got in several digs at Microsoft at its E3 press conference. As we move toward the cloud and new forms of digital and online distribution, companies clearly need to do more to communicate with customers about what kind of ownership they’ll have over their purchases. That’s true not just for consoles, too, as it’s an issue for industries like music and publishing. Microsoft’s 24-hour offline policy is just mystifyingly bad, but the firm has also done a poor job communicating about it. So far it looks like Microsoft is ahead of Sony in terms of launch timing. The Xbox One is scheduled for a November release, while the PS4 is coming “this holiday season”. While it’s entirely possible that the PS4 could manage to sneak onto shelves before the Xbox, Sony’s vagueness is cause for concern. If the PS4 launch slips into December, the company will miss the Black Friday bonanza in the US. Based on my rough impression of the two companies’ press conferences, Xbox One development seems to be further along than that of the PS4. Sony had several embarrassing game demos during its keynote where play was extremely stuttery and choppy. Microsoft had a few audio troubles and a couple hiccups at its event, but overall things went smoother. Also, Sony’s cloud gaming service for the PS4 isn’t due out until next year. Technically, Sony was a year behind Microsoft in its development cycle since the PS3 came out a year after the Xbox 360. While Sony managed to catch up enough to release its hardware in the same season as Microsoft, the PS4 platform will need the better part of 2014 to mature. Developers also seem to need some extra time to put together their blockbuster PS4 titles. inFamous Second Son, for instance, isn’t due out until Q1 2014 at the earliest. E3 brought us our first view of the PS4 design, while Microsoft showed off the Xbox last month. There’s not much to say here. The two consoles look very similar with their dark, angular designs. The Xbox One does appear noticeably larger than the PS4, possibly almost twice the size. However, I’d expect the size issue to only be a dealbreaker for a few customers. Sony has managed to come back from its rambling launch in February to outmaneuver Microsoft at E3. Between the lower price and the rhetoric around used games, the PS4 has the upper hand at the show. It’s still early, though, and the biggest battle is going to be fought by developers working on exclusive launch titles. The E3 demos of these games gave only an inkling of how things will turn out. Microsoft could gain back some ground with a simple price cut, and it would build a lot of goodwill if it toned down its policies about offline and used gaming. It’s not easy to admit a misstep, but it’s better to do so early on before too much damage has been done.